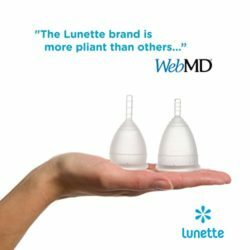 This Lunette Cup review might just convince you that this is the right menstrual cup for you. If you’re already using a Diva cup or any other kind of menstrual cup, or if you’re thinking about switching to a menstrual cup as an alternative to pads & tampons, then you’ll be surprised at just how much this little cup has to offer compared to competitors. My Lunette review will show you that the Lunette Cup is one of the best menstrual cups for beginners. 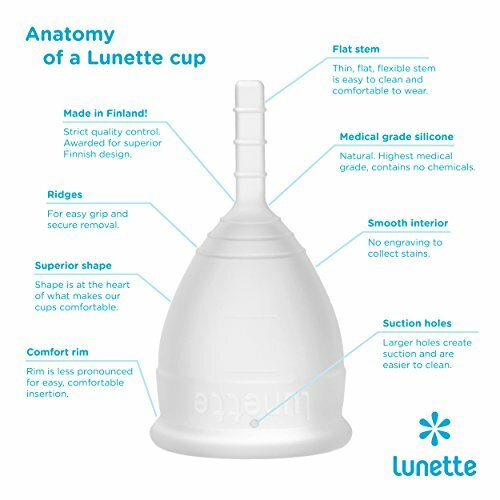 As I have mentioned in my complete menstrual cup buying guide, the Lunette Cup is one of the best reusable menstrual cup available today. It’s an excellent all-round cup which means it’s great for beginners or women who aren’t sure which cup to buy to start with. The Lunette cup is made in Finland so you can be assured that the quality is of the highest standard. The cup is constructed from soft, comfortable silicone that is medical grade and FDA approved. The design of the Lunette cup is less rigid than that of the Diva cup. Many women find it a more comfortable cup to wear, particularly if they’re a beginner, new to wearing menstrual cups or have just started their period. Size 1 is for women who are very active physically and need flexibility, who have a lighter flow or who are not sexually active. This makes it a great cup for teens. Size 2 is made of a slightly firmer silicone for women with weaker vaginal muscles. It also has a larger capacity so works better for a heavy flow. Softer silicone – The Lunette Size 1 is made of a softer silicone than the Size 2 (and many other cups) so it feels more comfortable and is great for women with particularly tense vaginal muscles i.e. teenagers, women who are virgins and women who are very active. Easy to clean – The Lunette has a solid stem which makes it a bit easier to clean out. Price – The Lunette is a more expensive cup. Roughly $10 more than the Diva Cup. Click here to read more Lunette Cup Size 1 reviews or to make your purchase. Click here to read more Lunette Cup Size 2 reviews or to make your purchase. Choose a Lunette cup if you value both comfort and capacity. If you’ve got a standard cervix height, the Lunette Cup Size 1 is a great choice for you because it’s not a terribly long menstrual cup. The Lunette Size 2 is 0.5 cm longer than Size 1 so isn’t ideal for a lower cervix woman. If you have a heavy flow, the Lunette Cup Size 2 offers a full 30 mL capacity and this comes without having to be as long as the Diva cup too. Note that the Lunette Size 2 is a more rigid cup than the Size 1. Lunette is easier to keep clean and insert. High quality silicone increases the comfort level. Most cups you have to cut/trim the stem b/c it irritates the labia skin, but this one isn’t a problem. I’ve heard of people who have a whole collection of cups w/removed stems where the Lunette is the only one they never bothered to cut. After trimming the stem of the Lunette I could not even feel it when using. The Diva Cup caused me a lot of pain when wearing because of it’s length and inflexibility. I forgot a few times I was even on my period when I used my Lunette! The model 2 is typically for women who have already given birth, however, it’s also for women with heavy flows. I have never had children, but am glad I have the model 2, definitely perfect for those of us with a full week 🙁 No leaking and can’t feel it at all. I’m so glad I gave the lunette a chance! I could find the cup easily AND removal is so much easier and better than the lily cup! This is easy to use and clean but most importantly very comfortable.